Vail Resorts is one of several big-name stocks set to post earnings results over the next few trading days. Stocks held steady last week as optimism over the strengthening U.S. economy was offset by worries over a potential global trade war. 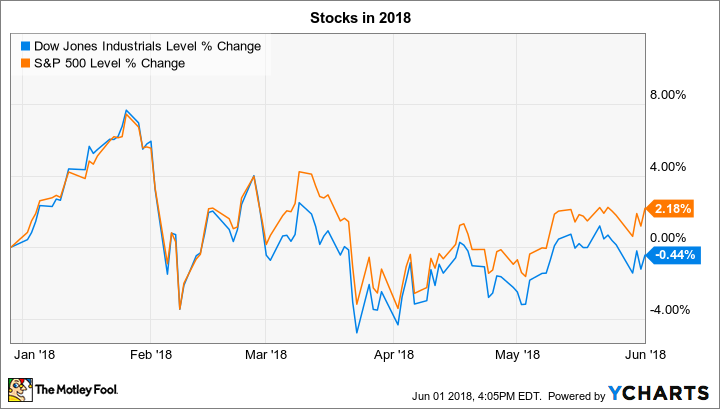 Both the S&P 500 (SNPINDEX:^GSPC) and the Dow Jones Industrial Average (DJINDICES:^DJI) are off their lows for the year, but also far from highs they set in late January. The week ahead includes a few highly anticipated quarterly reports that could move stocks for Palo Alto Networks (NYSE:PANW), Ambarella (NASDAQ:AMBA), and Vail Resorts (NYSE:MTN). Below we'll preview these upcoming announcements. Next-gen cybersecurity specialist Palo Alto will announce its fiscal third-quarter results on Monday afternoon. Investors have pushed the stock up recently on hopes that its solid 2017 momentum will carry on into the current fiscal year. Palo Alto's second quarter was highlighted by a healthy 28% revenue spike as its security platform reached 48,000 customers, up from 37,500 a year earlier. Its finances are improving, too, with operating margin stopping at 20.5% of sales compared to 19.8% in the year-ago period. CEO Mark McLaughlin and his executive team are targeting third-quarter revenue of about $543 million, which would translate into sales growth of roughly 26%. Investors will be looking for further improvements in billings, cash flow, and profitability as Pal Alto Networks builds a larger base of subscription and cloud-based revenue. At its last check-in, customer renewal rates were above 90%, and continued success on this metric will give the software specialist a good shot at market-beating growth in the expanding market for network and cloud security. Ambarella shareholders aren't expecting much good news from the video tech specialist on Tuesday. Its last report edged past Wall Street targets, but still included a painful 19% revenue decline that came courtesy of slumping demand in the niche for wearable sports cameras. Executives believe trends will improve this quarter as they continue to shift Ambarella's business away from its reliance on sales to GoPro and into promising segments like home security and automotive cameras. Yet they're still calling for revenue to fall by as much as 15% in the fiscal first quarter. On Tuesday, investors will be listening for updates on Ambarella's computer-vision platform, which management thinks will help the company target a massive market supporting autonomous and assisted driving. Its first chip is finding its way into manufacturers' hands right now, and a positive reception will be crucial if Ambarella wants to win significant market share in this highly competitive industry segment. It's a testament to Vail Resorts' diverse business that the ski resort operator could boost its top and bottom lines even during a brutal season that was marked by 30-year-low snowfall totals in many of its properties. Vail's focus on selling season passes earlier in the year helped it overcome that challenge. Its major acquisitions played a key role, too, as its new Whistler Blackcomb resort in British Columbia attracted record visitation in last year's peak season. Vail Resorts' focus right now is on improving the value of its current properties, with $150 million of capital spending on things like new lifts and upgraded restaurant and lodging offerings. It's easily the company's most aggressive annual spending program to date, but management is hoping that the extra capacity and better services will lay the groundwork for many more years of record sales. It's clear that executives are confident in both their finances and in the long-run stability of the business, given that they recently raised Vail's quarterly dividend by 40% to $1.47 per share.